With a background of 23 years retail and hospitality experience, they strive to be industry leaders and a benchmark in wholesale for the hospitality industry. They also have a passion for conservation, the environment and sustainable utilisation of our scarce and renewable resources. Livingstones Supply Co. actively participates in initiatives to put this into practice, sourcing sustainable and environmentally friendly products, continually looking at new ways to improve themselves in-house, as well as how they can contribute toward other projects that have the same goals as them. 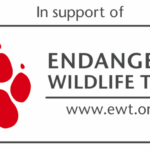 Becoming a corporate member of the EWT was thus a natural fit for an organisation that prides itself on supplying products that will enable the hospitality industry to offer sustainable and environmentally friendly service to guests. Summer is here and what a beautiful way to celebrate it with a fabulous, colourful picnic. 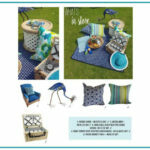 Livingstones Supply have set up a fun vibrant theme just for you featuring their new wicker picnic basket. As well as the popular double walled stainless steel ice bucket, they also have a new range of scatters which features broad spectrum hues of blue and brightly coloured textures that will add that pop of colour to any lounge or bedroom that needs it. The most important item for any foundation to a picnic is a picnic basket. This natural wicker basket includes 4 ceramic plates, 4 ceramic mugs, stainless steel knives, spoons and forks. They have accompanied this with the painted Bamileke stool which we have used as a table piece for the picnic. However in the hospitality industry, this can be used as a side table in a contemporary context, this stool traditionally was the most important piece of furniture in an African home. Feeling chilly in the late afternoon? Well then the sea spray throw is ideal as it features a fine textured zigzag pattern which adds life and a burst of colour to any setup. It is woven from viscose chenille and pure cotton. Display your picnic snacks with this lovely Cornflower blue Oblong plate, the colour wash used on this plate creates a tranquil and relaxing atmosphere whilst not being too vibrant of a colour to distract from the food. The colour wash and golden brown band on each Stone cast plate is applied by hand so that each piece has its own slightly unique finish. Our favorite feature in this picnic setup is the Metal bird, which is handcrafted using old recycled oil drums. Keeping within the blue colour scheme, these unique Hausa chairs compliment the hues. The curved features of the sofa and armchair pay tribute to the Yoruba chair – the classically arched throne of Nigerian kings and queens. Throughout Africa, the chair is believed to be the most important piece of furniture. A man’s chair speaks of his identity and his place in the community. 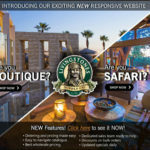 Livingstones‘ new website is now mobile friendly which adds the benefit of being able to shop on your mobile device. With an easy to navigate online cart / catalogue, as well as a feature of new products on their home page, the website is set to make things easier for users when looking for the finest garden equipment and service products. From Humble beginnings in 1986, operating out of a small factory in Marlboro, Sandton, Livingstones grew over time, based on the same philosophy, “Keep the customer front of mind. Deliver service and the customer will return”, now nearly 30 years later they are still working hard to achieve this.